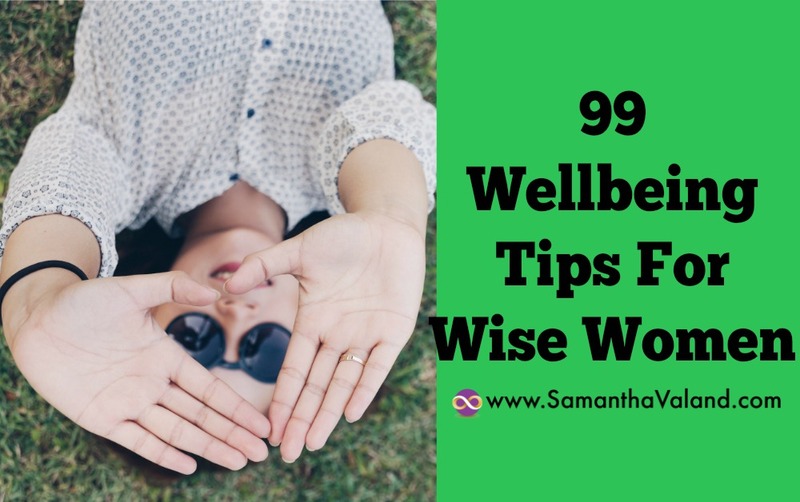 99 wellbeing tips to give you a wee bit of inspiration to blossom through your menopause. Eat protein at every meal and with any snacks. Feel fuller for longer. Be cautious with sports drinks as they can be calorific. If you are exercising for under an hour then water is fine. Herbal Tea is fabulous hot or cold and it has zero calories! Greek Yogurt is a fabulous source of protein – check it’s not Greek Style yogurt though big difference between the two. Mark in your diary when day 14 of your cycle is. It is the day you ovulate also known as ‘taking over the world’, you will feel awesome! If you crave foods when you have PMS, watch that it does not become a habit. Sugar is addictive! 3pm choc fix anyone! Do you talk yourself out of exercising? Change the time you workout if tired or go with a friend for accountability! Movable goal posts – adapt if a goal you have set for yourself is too big or the timing is wrong – keep going! Keep a PMS diary of find a app to track your symptom’s. If you know what’s coming its easier to prevent them! Practice portion control particularly with ‘healthy’ foods they are not calorie free! Plan ME time for every day this week. Add it to your diary & keep the apps – there is nothing more important than self care! New habits take a wee while to form. The more enjoyable the new habit the easier it is. So find exercise you enjoy! The hormone Leptin maintains a set point in the body. Speeding up metabolism when we are overweight, slowing down when under. Practice portion control – especially with ‘healthy foods’ they are not calorie free! Are you label savvy? Neither salt or sugar should be listed in the first 5 ingredients. Lowering estrogen levels can affect your mood. Listening to music, moving move and dark chocolate can all help to lift it! Swimming is a fab source of exercise. it often increases appetite so be prepared and have healthy quick food ready for after. Keeping a food diary it helps track what you eat and also how you manage your hunger, energy and cravings. How are your New Years resolutions coming along? Keep going, adapt wherever you need to! Weight training helps keep bones strong and an increase in muscle mass helps to maintain your figure. Essential fatty acids play in important role in weight loss, they slow down the rate which the stomach empties. Self care is not all spa days, it’s everyday small chunks of ME time, repeated often! If you’ve had a bad day & only a glass of wine will do. Find something else to raise your mood-music, walk, have a laugh! Be as inefficient as you can to ensure you move more. Lots of trips up stairs & walking the long way round! Do you manage to eat 5 a day fruit and vegetables a day? The order you eat the food on your plate can have a big impact on feeling full. Experiment & mix it up. Starch first or last?